An over 3500 acre wildfire took over the hillsides just east of Rowena, Oregon on Tuesday of last week. People in about 150 homes around the blaze were evacuated, and one home was actually destroyed. 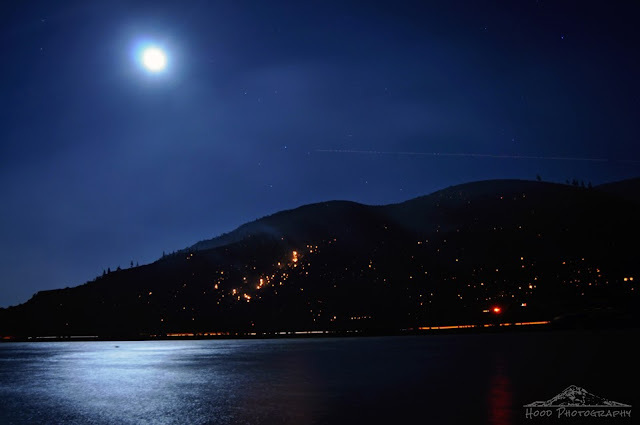 On Friday night I headed out with my camera to capture the beginning day of the "Super Moon" and found myself heading east through the gorge, crossing the Columbia River and ending up at Doug's Beach outside of Lyle, Washington directly across from the fire area. I took this long exposure to show the many hot spots on the hillside above the cars along I-84, which at the point that this photo was taken was only 35% contained. Later at home when I downloaded the photo, I noticed the shooting star streaking across the sky directly above the hill, and hoped that it was a sign of sorts that the worst of the blaze would soon be over. Fortunately, I was right because the evacuation of most of the area residents has been lifted and those people have been able to return to their homes. Wow - such an interesting capture! It really shows the extent of the fire. And you even got a shooting star! Great shot of the moon. Glad to hear that folks were able to go home again. The northwest is getting more fires than I remember from previous years. There are dozens of forest fires burning in BC now and 80 firefighters are coming from Australia to help control them! We did hear about the fires in the states of the northwest and I'm sure hoping everything dies down soon. It's been a terrible summer so far for fires! What a capture! The hot spots remind me of pictures in a book I have on fires in BC from some years ago. A very "moody" shot and the shooting star was a bonus. Thanks for sharing. Glad the fires died down. This is an amazing photo. All the light from the moon, the fire, the shooting star, the cars on the highway. Glad to read at the end that the fire was contained and people could go back to their homes. Wow what a capture. I hope everyone was safe. Extraordinary shot♪ Glad to know things are getting better. Stunning photo, but the fires are horrible. The hot spots really tell the story!! Your shooting star is so pretty. How awful about the fire! You do present a nice capture. Beautiful and awful at the same time. Great photo. Wild fires are so scary, I am glad it wasn't worse than it was.